At a routine examination, my dentist found a hole in my upper front tooth, at the gum line. He told me that it was “root resorption,” and he wasn’t sure if the tooth could be saved. Can you please tell me more? An example of external (cervical) resorption that starts from the outside and works inward. For adults, root resorption is an uncommon and troublesome dental condition in which the body’s own cells eat away and dissolve tooth structure. It isn’t a problem for growing kids, however; in children, resorption is the natural process that causes the roots of baby teeth to be removed, facilitating their replacement with permanent teeth. Root resorption in permanent teeth may begin on the inside of the tooth (internal resorption), but more often it starts from the outside and works inward (external resorption). The effects of external (cervical) resorption (ECR), which you seem to be describing, occur near the gum line at the cervical (“neck-like”) region of a tooth. In its early stages, this condition may produce pink spots where the enamel is undermined and filled with the pinkish cells that do the damage. In time, these spots progress to cavity-like areas. Resorption (breakdown) and deposition (adding to) are normal processes by which the body maintains balance. This is especially true of bone, in which it is a response to normal stressors: pressure and tension. In fact, these processes are what allow orthodontic movement of teeth to occur. Once formed however, adult teeth do not normally resorb. While the exact nature of external cervical resorption isn’t fully understood, there are a number of factors that can make someone more likely to develop it. If excessive orthodontic force is placed on teeth, it can cause root resorption in later years. Or, a tooth that has been traumatized may suffer damage to the periodontal (“peri” – around; “odont” – tooth) ligament. Disturbance to this ligament, which attaches a tooth to the bone, can initiate resorption. Certain habits like teeth grinding (bruxism), and some dental procedures, such as intra-coronal (“intra” – from within; “coronal” – crown) tooth-bleaching, may also make an individual more predisposed to ECR. However, the vast majority of people with these risk factors never go on to develop this problem. ECR is most often seen in the upper front teeth (the upper canines and incisors), and on the lower first molars. It’s possible for this painless condition to go undetected for some time, first showing up as a distinct dark spot on a routine x-ray examination. That’s unfortunate, because the longer ECR goes untreated, the more damage it can do. As the damage progresses, more and more of the tooth’s root structure — both its outer layer (cementum) and its inner layer (dentin) — are eroded away, and the affected tooth may look like it has a cavity. Unlike this far more common malady, however, the lesion (damaged area) caused by ECR doesn’t feel “sticky” to a dental probe. Once root resorption has been discovered, it is necessary to treat it as soon as possible to prevent more damage from occurring, because the destruction can be rapid. Yet, as your dentist noted, it isn’t always possible to save an affected tooth; treatment depends on how far it has progressed when it is detected. If the lesion is small, it is sometimes possible to expose the affected area of the tooth’s root with minor periodontal (gum) surgery. Then the tissue cells causing the damage are removed, and a tooth-colored filling material, a composite resin or glass ionomer cement, is used to repair the tooth. Sometimes, a single-tooth orthodontic procedure may be recommended before surgery. With this treatment, the tooth is gradually moved outward from the jawbone. As it moves, gum tissue moves along with it, and new bone is built up behind. Then, after surgery, the final contours of the gum line will match up, and gum recession at the affected tooth can be avoided. Root resorption should be treated as soon as it’s detected to prevent more damage from occurring, because the destruction can be rapid. If ECR has reached the area near the dental pulp (the tissue housing the nerve in the tooth’s center), root canal treatment may also be required. The more extensive and invasive the resorption, the less likely it is that the tooth can be saved. Often, in cases where ECR is advanced, the preferred option is to extract (remove) the tooth and replace it with a dental implant. In some cases, it isn’t possible to see how much damage has been done — and whether or not extraction is needed — until the root has been exposed by surgery. However, CBCT (cone beam computed tomography) scans can reveal tiny anatomical structures inside the tissues in three dimensions, with far greater detail than standard x-rays. This high-tech imaging method can help make treatment planning in advance more accurate. 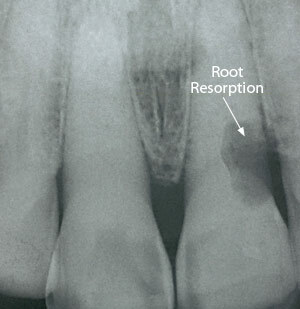 I hope this brief explanation has helped you understand more about root resorption. While this condition is uncommon, it is certainly possible to treat it successfully.